The HY101CTP 10.1 inch LCD Module is designed to work with HAOYU Electronics's ARM development boards and MarsBoard's single board computers. 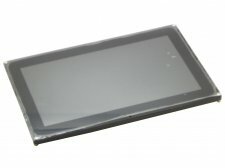 It has one 10.1 inch TFT LCD including capacitive touch screen with 1024 by 600 pixels resolution. RGB signal interface is compatible with HY050CTP-HD, HY070CTP, HY070CTP-HD, LVDS signal interface different with HY070CTP-HD. LCD display timing is compatible with HY070CTP-HD, capacitive touch driver compatible with HY050CTP-HD, HY070CTP, HY070CTP-HD, but HY101CTP capacitive touch Y axis polarity different with HY070CTP-HD.